Lilies are one of the country’s favourite flowers, with such a beautiful bloom and delicate scent it would be hard not to love them. Aberdeen Flowers have a fantastic selection of Lilies varying in type colour and type. 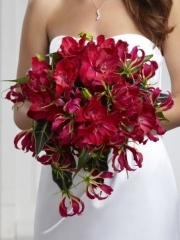 Our Lily bouquets can include other flowers or just lilies depending on your preference. At Aberdeen Flowers we aim to meet all of our customers’ requirements because we care about your satisfaction above all else. Aberdeen Flowers have a large team of florists from all over Europe with creative backgrounds who are highly skilled florists. Everyone in the Flowers Aberdeen team works hard to ensure that you are always delighted with everything we make for you. Our Florists Aberdeen are dedicated to providing the best possible service and the most beautiful flowers possible. To ensure the quality and freshness of our flowers, Flowers Aberdeen import everything we use directly from its site of cultivation in Holland so that you know we only ever use flowers that are up to the highest standards. Whether you’re ordering flowers for a gift or arrangements for an event, our Florists Aberdeen always pay your order their full attention to make sure that every detail is perfect. You can include our beautiful lilies in any Aberdeen Flowers arrangement, whether it’s for a birthday, anniversary, congratulations, get well soon, new baby or any other occasion or reason for sending flowers. The enormous range of flowers we have here at Flowers Aberdeen means that there is sure to be something to suit your taste. Our Florists Aberdeen are always able to help you when you’re choosing which flowers to send because the wealth of expertise we have here at Aberdeen Flowers allows us to advise you on any type of arrangement you wish to order. If you know just what you want, Flowers Aberdeen will be delighted to help by offering you our bespoke service which gives you the control over every detail of your order. You can speak to our Florists Aberdeen about your exact preferences for colours and flowers and they will endeavour to create your vision for flowers exactly as you imagined it. This way you can always include your recipient’s favourites to make sure that your Aberdeen Flowers gift is even more personal to ensure their admiration! If you really want to spoil that special someone you can include a gift item along with your flowers and Florists Aberdeen will ensure that this is also delivered safely to the correct address. Flowers Aberdeen offer delivery on many items including chocolates, champagnes, balloons and teddies, so we have everything you need to treat somebody right here. This option is great and very convenient because it means you are always able to order wonderful gifts whatever the occasion without having to worry about going to get them because our Flowers Aberdeen drivers are always as careful as possible with your orders. If you’re busy at work or stuck in the house it’s easier than ever to send your gifts and flowers just by ordering online or over the phone. Aberdeen Flowers arrange your flower orders by hand and then carefully wrap them in a beautiful gift wrap, all of our flowers are delivered in water to ensure their freshness and quality. Aberdeen Flowers are dedicated to providing everything our customers need and if there is something in particular you have in mind that our website doesn’t offer you can give us a call and explain what you had in mind. Aberdeen Flowers have over 40 years of experience in the industry and have this experience to ensure the best quality products available.